The Barghest, as large as a bloody calf, seemed even more terrifying up close. Clifford Engram questioned the decision to offer it a job so soon after finding himself flat on the ground with the brute standing over him. No matter, he needed the help and the creature and his master were uniquely qualified. Engram kept his hands out and clearly visible. No sense in antagonizing the creature. At this point, the man behind the monster probably didn’t understand how dangerous it was. The eight police officers it attacked while they were not dying, they were not getting better either. Their wounds refused to heal, no matter what treatment was applied. Doctors called it cellular necrosis. Unfortunately for them, this was a side effect of wounds created by creatures from the Second World. Injuries caused by malice by creatures from the Second World had to be forgiven, blessed or a greater entity would have to command the creature causing them to release those poor bastards from the effect. That was his task today. Without his help, those men would die in a few days from a slow rotting of their flesh. “Ben. I know you can hear me. I need your help. I know what you’re doing.” Or at least I suspect I do. Things seemed so much easier a week ago. Up close, the Barghest seemed more terrible than it had at a distance. As Engram stared at it, the creature grew larger, spiny growths appeared on its back, moving in the same direction as its fur. The jaws grew wider and when it bared them, Engram felt a bit sick. A physical reaction which emanated from the creature, a fear reaction as unnatural to him as flying without wings. Is he trying to intimidate me using magic? Engrams’ curse mark agreed and burned as it resisted the glamour. The wolf turned his head as if he smelled something. He sniffed twice and released an ear-shattering howl. This sound drove Engram to his knees and caused his nose to start bleeding. Then the beast turned in the direction it gained a scent and leapt into the murk of a nearby alley. When Engram’s ears stopped ringing, he wiped his bleeding nose on a handkerchief and shook the sound out of his head. That’s when he noticed a scraggly group of stray dogs standing in front of him; an unexpected group of unfriendly-looking dogs. While they were a fraction of the Barghest’s size, their number did give him pause. If nothing else, he would have to fight his way through them to give chase. Yes, his reinforced coat would offer some protection, but it wasn’t as if they were only going to chew only where he wanted them to. Right here lads, only on the arms, eh? As he tried to back up, he looked around him and noticed all avenues of easy escape were covered by six or seven other strays of varying shapes and colors. At least two of them were mastiffs or pit bulls, both known for their biting prowess. Engram, more a cat than a dog person, remembered the first rule of predator-prey relationships. Don’t run. They like that. Putting away his handkerchief, he took out a no-brand sucker, he used as a cigarette substitute. The animals did not react when he reached into his coat. They ceded no ground, nor approached any closer. Their job is to keep me here. Sorry boys, I can’t allow that. Can’t count on being able to find Fisher again if he remembers anything of this encounter. Reaching back into his coat, he pulled out three small packets. He picked them up at an Italian restaurant earlier. Crushing the packets his hands, he ground the powder into a fine dust splitting it between his two hands. “Come on, lads, haven’t got all night.” He ran into the alley and the dogs sprinted after him. Swirling the powder into the air behind him, he used the tiniest bit of Qi, to spread the dust into the faces of the slavering hounds. The yelps and whining disappeared into the distance along with his pursuers. For the next few minutes the detective ran purely on instinct. Easiest path following the direction of the wind. A random dog might appear, one who didn’t get a chili powder surprise but a swift kick usually resolved the issue and he escaped with little more than minor injuries. Then he heard the howl, the howl he heard the night of the attacks. 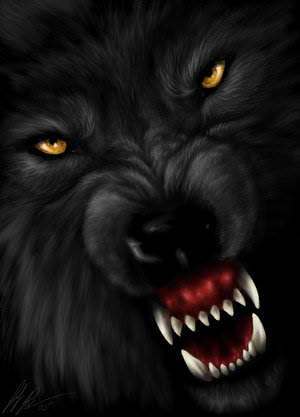 A howl which chilled the blood and froze it in men’s veins. He stopped and oriented himself. Less than two blocks. He reorder his Qi into the elemental fire and ran toward the melee. He marshaled his breathing and could feel the heat building in his breath. Engram wasn’t sure what to expect when he arrived, but Fire manipulation was his strongest Qi mastery, and the growling and shouting indicated a full out struggle. It was even stranger once he could see it. There were eight maybe ten men attacking the wolf creature. Their arms were replaced with longer tentacle-like appendages which they whipped though the air with devastating speed. As their blows struck ground or nearby buildings, splinters of rock flew up and ricocheted around the small courtyard where this confrontation was taking place. The Barghest was fast, flickering in and out of existence seconds before each tentacle landed. It jumped backward and howled in the direction of the most hideous and malformed of the young men attacking it. The hybrid man-monster vibrated, trapped within the sonic wake, his flesh tearing itself asunder under the assault. Seconds later, the hybrid was blown apart, raining chunks of steaming flesh skyward in the cool London evening. Seconds later, the chunks of flesh started to smoke and disappeared. Each creature, once dispatched, turned into a puddle of noxious slime. The boy who had been distracted by his phone didn’t notice anything until he thrown bodily back into the building. Engram finished his movement by releasing the fire, the price of his movement in the direction of the two unknown creatures. It shot down his arms and onto his hands, before flowing over the beasts just out of reach. His flesh sizzled and he ground his teeth. The Qi flowed languidly and crossed the short distance like foxfire, bathing them in a wispy flame. Engram pulled his arms back toward himself and sealed himself to the Earth, borrowing its resilience and durability. His arms were crossed in front of his face as the foxfire erupted into a bonfire. The other monstrosities paused as the screams of their comrades tore through the small space. The Barghest, took advantage of their momentary distraction and chewed off the head of the closest horror which had managed to enshroud it in one of its tentacles. The smoke-like form of the Barghest had a purple burn where it was touched. Its fantastic speed was diminished though it was still appeared more than a match for the remaining three. Their human shapes seemed to be breaking down, they were sloughing off human flesh in green glistening chunks. They were breaking out of their clothes, as they were shedding their human forms completely. The mystic investigator was unable to move as long as he channeled the Earth’s power. Flames swept over him as the burning corpses fell about him draping him in their ignited flesh. Two of the remaining three turned away from the Barghest and squealed a terrified sound. One vaulted into the sky and vanished in the darkness. The other became a swollen and bloated thing, dripping liquids as it grew, becoming nearly eight feet tall. The Barghest dispatched the last one who had not moved away quickly enough with a howling burst of sound. Engram was grateful he had not dropped his Earth shield since the creature did not seem to care who was affected by its power. It’s zeal and bloodlust were evident. Even injured, its ferocity was undiminished. It let loose another howl and a response from all around echoed in the distance. The giant strode toward Engram, turning its back on what it deemed to be the lesser threat of the Barghest. A mistake. The wolf did not consider itself the lesser threat and launched itself through the air toward the giant back. Without a backward glance, it whipped its tentacle through the air and with a cracking sound struck the Barghest right in the chest. The powerful snap knocked the Barghest back at half the speed of sound. It crashed into the building behind it and disappeared into the rubble of the old brick structure. Engram could no longer see or hear it through the lingering cloud of dust. The dogs who responded to the call, roared onto the scene each slavering and wild. There were more of them than the creature could turn its attention to and soon it was covered in dogs, tentacles being chewed on. Its roars of rage rebounded off of every wall, and coupled with the howling and barking, it was more of a primal hunt in the wild than in the center of London. Engram looked at the burning forms of the two creatures in front of him and transferred his Qi toward the mastery of flame, a second too soon. The creature managed to whip one of its tentacles, dogs locked in a death grip around his body. This is going to hurt… He called the fire still roiling around on the ground and whipped it into a frenzy as he heard his ribcage beginning to crack. His Qi swept through the fire and bound it to the giant. Its legs ignited. Engram felt the conflagration even as his long coat began to smolder. The beast, afire threw Engram through the air. He didn’t remember hearing his arm breaking his fall as the ground rushed up to meet him. He turned over bonelessly, barely capable of movement. The fire swallowed the creature, dogs and all and Engram felt a momentary pang of regret for their passing. The Qi based fire burned brighter as Engram watched, willing it to be as hot as he could make it. He only had a few more seconds of consciousness. He had to make it count. He never even heard the sound of the Barghest as it came out of the building and stood over him, blocking the light from the burning creature. It stood over him and its jaws came toward him. “Damn, so close.” Engram’s eyes closed as he released his Qi. The glowing red orbs filled the sky above him, then darkness.